Observing that her teenage daughters were beginning to experience some of the same fears that had once burdened her -- how attractive am I? do people like me? do I dare speak up? 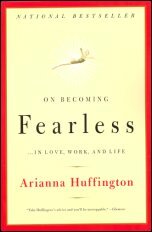 -- Arianna Huffington set out to explore the ways in which fear affects all our lives. In stories drawn from her own experiences and from the lives of other women, she celebrates the moments of extraordinary strength, courage, and resilience that result from overcoming fear. Her inspiring book shows how all of us can become bold from the inside out -- whether our goal is feeling comfortable in our own skin, getting what we want in love or at work, or changing the world.